The extraordinarily intense and beautiful body of work Frances Hatch has created for this exhibition is the result of a year that has brought transformation to all aspects of her life since she and her husband Steve Batty moved to Burton Bradstock just up the coast from Sladers Yard. Frances has responded with some of the strongest work of her career. Many thanks to all who took part in the fascinating discussion with Frances Hatch and Elisabeth Bletsoe last night, especially Steve Batty who chaired the evening with great flair. The comments from the audience were exceptionally interesting. They took Frances and Elisabeth into discussion of the numinous as well as their very strong connections to earth and place. ’The moon is going to play a large part in this emerging collection: it seems to have ‘called me out’ to paint as it rises and sets all along the Chesil – and indeed wherever I’ve been- over this last year. I will offer moon light mixed with the earths of each place. I have come to experience each moon as if different from the last one. I’ve given them names associated with something touching my experience at the time. 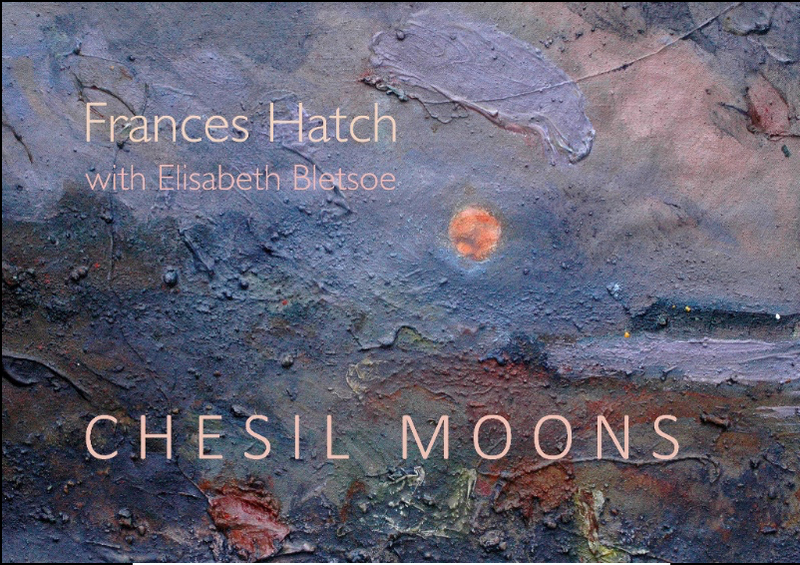 The booklet Chesil Moons accompanies the exhibition, with words by Frances Hatch, a new poem by Elisabeth Bletsoe and foreword by Steve Batty. The booklet is available now at £9 plus £1.50 p&p within UK. 32 pages. Full colour throughout. 14.6 x 19 cm. 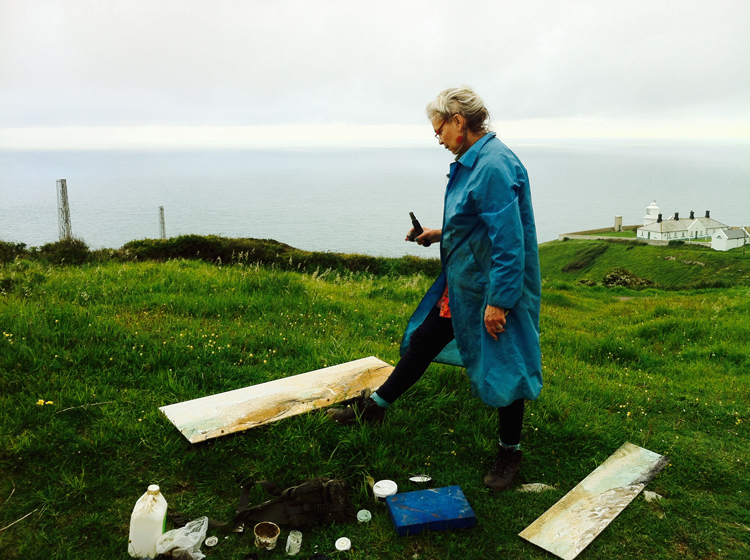 FRANCES HATCH developed her plein air practice not only to make work outdoors but to involve the materials she finds around her in the landscape, collecting earth, rocks, minerals and litter to use as her palette. Wild fruit juices, puddle mud and raindrops bespeckle her sketchbooks. Armed simply with paper and a portable toolkit containing some gouache, watercolour or acrylic paint and a binding medium, Frances heads off to the beach often by moonlight to create her response to the place at the time she finds it. Frances Hatch studied visual art at Cambridge, Aberystwyth and Goldsmiths and has an MA in printmaking from Wimbledon College of Art. She has always painted outdoors. Her work has grown in strength and confidence following a trip to Antarctica in 2005 followed by a Research Bursary from DVA/ExLab which supported her study of the history and craft of making and consolidating pigments. She has been a senior tutor at West Dean College since 1995, has published books about her projects and contributed to other books both as an illustrator and practitioner. Booking essential as numbers are limited. Fee: £25. Please phone 01308 459511. Tickets: £10 or £25 with buffet dinner to follow. Please phone 01308 459511 to book. Frances, beautiful meaningful and inspiring thoughtful work .thank you for giving so much of yourself in your art.